Each year, about 25 million people in the U.S. experience migraine headaches, and about 75% are women. Migraines are intense and throbbing headaches that are often associated with nausea and sensitivity to light or noise. They can last from as little as a few hours to as long as a few days. Many of those who suffer from migraines experience visual symptoms called an "aura" just prior to an attack that is often described as seeing flashing lights or that everything takes on a dream-like appearance. Migraine sufferers usually have their first attack before age 30 and they tend to run in families, supporting the notion that there is a genetic component to them. Some people have attacks several times a month; others have less than one a year. Most people find that migraine attacks occur less frequently and become less severe as they get older. Migraine headaches are caused by a constriction of the blood vessels in the brain, followed by a dilation of blood vessels. During the constriction of the blood vessels there is a decrease in blood flow, which is what leads to the visual symptoms that many people experience. Even in people who don't experience the classic migraine aura, most of them can tell that an attack is immanent. Once the blood vessels dilate, there is a rapid increase in blood pressure inside the head. It is this increased pressure that leads to the pounding headache. Each time the heart beats it sends another shock wave through the carotid arteries in the neck up into the brain. There are many theories about why the blood vessels constrict in the first place, but no one knows for sure. What we do know is that there are a number of things that can trigger migraines, such as lack of sleep, stress, flickering lights, strong odors, changing weather patterns and several foods; especially foods that are high in an amino acid called 'tyramine. 'You can reduce the likelihood of migraine headaches by making some lifestyle changes. 1. 22 Million women are affected by migraines in the U.S. each year. 2. Medical science has discovered that most headaches are caused by damaged structures around the neck like joints, ligaments, muscles, and cervical discs, all of which have complex nerve endings. 3. Research has proven certain natural treatments have great success with headaches - even better than massage and medications - and with NO side effects. At Jernigan Chiropractic we take the "Direct" approach to help relieve your headaches. 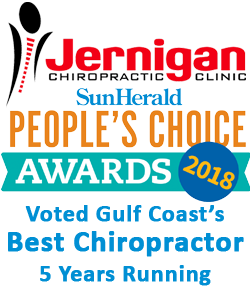 We've helped hundreds of patients become pain free from headaches by restoring normal motion to the neck, reducing muscle spasms, improving posture, and relieving nerve pressure through gentle, safe, effective chiropractic care. Call Today, let us help you live a pain free life again. 228-896-7574. "I was in an accident several years ago. It led to chronic neck and low back pain and I had headaches every day. Dr. Jernigan helped me get out of pain and stay out of pain"